A dead leg (also known as a quadriceps contusion or bruise) is caused by a sudden forceful or sharp impact to the thigh, which causes the muscle to press against the femur (thigh bone), causing a rupture which leads to swelling and/or bruising of the thigh muscle. The level of contusion can vary in grades (1, 2 and 3) depending on how severe the impact is. Although it is often classified as a minor injury in most sporting events, it should not be ignored when it occurs to an individual. The correct diagnosis and treatment is vital to ensure that the healing is not delayed by aa hasty return to exercise or training and to prevent any long term damage to the area. Intramuscular contusion – this type of dead leg occurs when the muscle tears with the lining (sheath) surrounding it. Because of the sheath, any internal bleeding is likely to stop with a few hours, but as the blood cannot escape the sheathed area, there is slight bruising and pain. This type of dead leg can usually take a few days to a few weeks to recover from. Intermuscular contusion – this dead leg occurs when the muscle, as well as the sheath becomes torn and damaged. For this reason, the pain and bruising may last longer especially if treatment is not applied immediately after. In contrast to intramuscular contusion though, the individual is likely to recover much quicker from this type of contusion as the fluids can flow away from the point of injury. Visible bruising is often common with intermuscular contusion. Other sports such as baseball or cricket, wherein an object such as the ball or bat can come in contact with the quadriceps can also result in a dead leg. Depending on the kind of impact experienced, some contusions can be light and unnoticeable whilst others can be disabling for the individual. The contusions are usually in three grades of severity. Grade 1 – this is the lightest form of dead leg with the individual likely to feel tightness in the quadriceps although there is unlikely to be much swelling. Straightening the leg at the knee is not likely to cause much pain and there is normal full range of movement especially if the affected thigh is treated quickly. Grade 2 – at this grade, the individual will usually have a severe limp and will be unable to walk properly of stand on both legs without adequate support. Possible swelling may occur and straightening the leg may cause pain at the quadriceps. Any pressure applied to the site is likely to cause pain also and there may be some visible signs of bruising with slight twinges and the inability to effectively bend the knee. Grade 3 – this is the most severe form of a dead leg where the individual has received an impact to the thigh that is almost crippling. Due to this, they will be unable to walk without the aid of crutches or move the leg at all freely. Bruises, swelling and severe pain are major characteristics of this thigh contusion grade. Recovery of Grade 3 contusions are likely to be between 4-12 weeks. If you experience a dead leg or believe you have one, it is best to visit a doctor as soon as possible. He or she is likely to examine the leg to ascertain whether it is indeed a contusion of the quadriceps muscle and if so, if it is a intramuscular or intermuscular contusion. The examination may also include tender pressure to the area and more details in regards to the cause of the injury and the symptoms that have been experienced in particular any bruising or swelling to the thigh area. Your range of motion is also likely to be tested to see what grade of contusion is being experienced, and what the most effective treatment option should be. In extreme cases where the dead leg does not get better or even gets more painful after a few weeks, the doctor might perform an MRI scan on the area to rule out any serious issues and understand the full extent of the injury. Even if the dead leg seems like it is very minor and healing is progressing it is important that the injury is looked at by a qualified doctor or physiotherapist. This is because there are certain conditions that can arise as a result of thigh contusions; these are known as compartment syndrome and myositis ossificans. 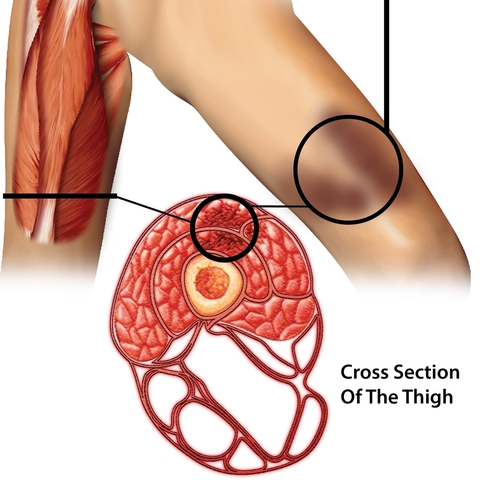 Compartment syndrome – a rare but serious complication of quadriceps contusions that can occur when bleeding from the original injury is trapped within the muscle sheath. As the muscle is covered and compressed by the blood, oxygen cannot get into the surround nerves, tissues and blood vessels which can lead to long-term muscle damage. A health specialist should be contacted immediately if you start to experience pain that is worse than that of the initial injury. Myositis ossificans – this is also a rare but potentially serious problem that can occur when bone starts to form inside the muscle, it is better to treat it as soon as it occurs, rather than wait as it can cause issues with movement in the long term. The first stage of treating quadriceps contusions (dead leg) whichever grade it is, is to apply the RICE principle as with most tissue injuries. Rest the injured leg on a steady platform and apply an ice pack as soon as possible to the area to slow down the flow of blood within the muscle, this should be done for 10-15mins every 2-3 hours. Compress and wrap the area securely to immobilize the area ad keep the swelling down as much as possible. Finally elevate the injured leg keeping it immobile as this will help drain the fluids in the area reducing pain, swelling and internal bleeding. It is important to note that heat should not be applied to the dead leg area as it can increase swelling and bleeding as well as increasing the chance of myositis ossificans. Massages or any kind of rehabilitation program should only be carried out by trained professionals and only when pain and swelling has reduced. Trying to participate in activity with the injured area too soon can also increase the risk of myositis ossificans. Preventing a dead leg is not easy as it can happen at any time during contact sports, the best hope of preventing such an injury is to adhere to certain procedures when involved in such high-velocity contact sports. Wear protective kit – in sports such as hockey or American football where such contact to the thigh is of a high occurrence, thigh pads are usually worn to protect the area. Ensuring the right type and size pads are worn is essential to reducing the risk of injury. Take calculate risks – it is essential to e aware of your surroundings, weighing up and judging each situation e.g. running in for a tackle or running into the path of a tackle. Knowing when to pull out of a situation or reducing the velocity in which impact occurs can sometimes be the difference between a major collision or none at all.